There can be no doubt why California is losing their credit rating and respect in the business world. The administration that is elected to manage all permitting and regulatory statutes can't keep their promises and habitually act in bad faith both to petitioning companies and municipal agencies. They also coerce qualified appointees who resist caving in to the will of approval committees on contentious issues. The pages of this blog are filled with the horror stories of carefully negotiated bipartisan supported legislation that gets axed by ideologically-run legislative committees or baldly rewritten by unelected staffers. The fate of AB 222 in 2010 was the latest sorry saga. The outcome of that debacle was so egregious (conversion technologies with any emissions could not be permitted - a condition for which no company could comply) that CalRecycle decided it had no choice but to abide by the spirit of the legislation rather than the letter of the overreaching statute. They notified a Canadian company, Plasco Energy Group, and their contracting municipal waste authority in Salinas Valley that if they succeeded in surviving the regulatory hurdles, they would qualify under the state's Renewable Portfolio Standard (RPS). Based on that assurance, the municipal utility and private enterprise have invested time and considerable resources to meet the environmental requirements. A new governor and a newly nominated Director of CalRecycle, Caroll Mortensen, expressed their commitment to that legal opinion - until the eve of the final decision on her appointment. Suddenly, and in bad faith, the previous legal opinion was rescinded. 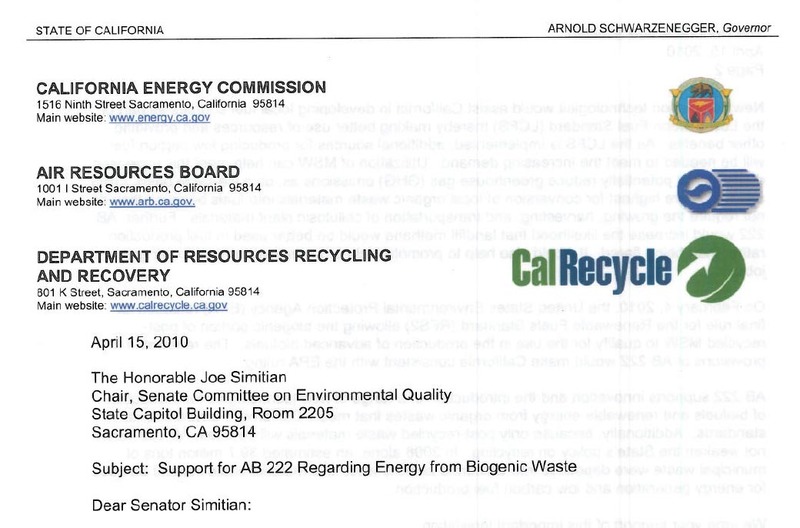 Below is a letter written by Jim Stewart, Chairman of the Bioenergy Producers Association, to Governor Brown recounting the sequence of events and stressing the lack of ethical integrity in the treatment of the parties by CalRecycle. Another detailed technical and legal analysis of this travesty has been published by Michael Theroux on his excellent TeruTalk blog. "Trust" is rapidly becoming a four-letter punchline for business developers when relying on Sacramento for fair and honest treatment. This could be the blackest mark tarnishing Jerry Brown's legacy as governor - that and the resulting deficit. On Wednesday, May 23, 2012, the Director of CalRecycle issued a letter rescinding the agency’s November 23, 2010, legal opinion that the Plasco/Salinas Valley gasification project is a qualifying renewable energy project in the State of California. This letter had the effect of destroying the economic viability of this project, and the trust that private companies and local governmental agencies should be able to place in the actions of state government. 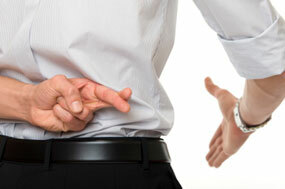 In a moral sense, that trust is the number one consideration. This rescission came after Plasco Energy Group, a Canadian company, and the Salinas Valley Solid Waste Authority, had, in good faith, made a significant financial commitment over 18 months to comply with CEQA and other permitting requirements in costly detrimental reliance upon what they understood to be a formal opinion by the State of California. Plasco further had felt encouraged, because you personally had made a telephone call to the company, expressing interest in the technology. In notifying Plasco of its decision, CalRecycle said that it did not want to “hurt” the company or the Salinas Valley Solid Waste Authority, which has devoted seven years to its vision of a permanent non-landfill based waste management system. CalRecycle’s Director asked Plasco to continue its work on the Salinas project and to “trust” the state to take the legislative steps necessary to enable the company to move forward. How can the state ask Plasco and the Salinas Valley Solid Waste Authority to continue to make substantial capital expenditures on this project when there is no assurance that the controlling legislators in your party who have blocked this industry’s progress in California for seven years will now enact the changes necessary to enable companies like Plasco to operate in the state with confidence? Indeed, just the opposite appears to be the case. It is strange that this new rescission letter arrived one week before the confirmation of the new Director of CalRecycle, and the decision came abruptly and without any prior consultation with stakeholders. For seven years, ideological rigidity in the legislature has thwarted every attempted revision of statute that takes into consideration new methods of dealing with California’s energy crisis via the productive use of the 30 million tons of post-recycled municipal solid waste that California places in landfills each year. In so doing, the legislature has posited as irrelevant such issues as energy independence, national security, a better environment and job creation. As a result of the uncertainties that state government has perpetuated, California’s biobased technology companies have already moved out of California or sited in other states thermal renewable energy projects amounting to approximately $1 billion in capital investment. Is it any wonder that Chief Executive.net recently ranked California as the worst state in the nation with which to do business for the eighth consecutive year? We sincerely doubt that Plasco will sustain its presence in California unless your administration takes immediate action to reverse this ill-advised decision, or it is able to show Plasco a clear path forward that it can rely upon. This decision is resounding among those communities that are seeking alternatives to landfilling in the state, and throughout the emerging multi-billion dollar alternative energy, advanced biofuels and biobased chemicals industries. Once again, state government has turned its back on some of the most promising new industries of the 21st Century. Unless action is taken promptly to resolve this issue, it is certain to shut the door on any remaining confidence this industry may have with regard to doing business in this state. I learned today that the Biomass Thermal Energy Council has praised the formation of a new BIOMASS CAUCUS in the U.S. House of Representatives. Led by Rep. Charlie Bass, R-N.H., and Peter Welch, D-VT., this coalition will seek to support the development of biomass and elevate the renewable resource's profile in Congress. "We strongly support the creation of the Biomass Caucus and commend the leadership of Reps. Bass and Rep. Welch, as we believe the caucus will become a venue for members of Congress to discover the role biomass can play in meeting the nation's goals of job creation and energy independence," said Joseph Seymour, acting BTEC executive director. Readers of this blog can help influence the success of the BIOMASS CAUCUS by urging their representatives to join the caucus and stay attuned to its recommendations. Readers can find their Representatives websites by visiting http://www.house.gov/. Once there, write a personal message of support. Below is the one I wrote to my Representative, Brad Sherman, of the Los Angeles San Fernando Valley. I am writing to you to request that you join the newly formed "Biomass Caucus" forming in the House. Although it may not seem to be germaine to most of your constituency I can attest, as a bioenergy marketing executive, that the future of bioenergy in the country will impact the country's energy and economic self-reliance while enhancing our environmental sustainability and national defense capabilities. In Los Angeles Co. there are multiple efforts to convert green waste and municipal solid wastes (MSW) into power and fuels by the DWP and DPW. 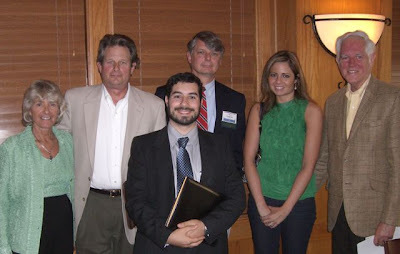 The SFV has a Green Valley Team and a Bioenergy Producers Association. The military is looking for ways to utilize MSW to make bases more energy self-reliant. But policies and regulations in Sacramento and Washington are unstable, counter productive, or non-existent. That is why the BIOMASS CAUCUS is important - it can help clarify issues and build consensus on how best to support bioenergy R&D and deployment so necessary for a sustainable future. Even GOP Texas Oil President George W. Bush attested we are addicted to oil. Proper development of biofuels is the only liquid transportation alternative to gasoline and diesel to end the addiction. Biomass pellets and biocrude made from woody biomass and ag residues are also an alternative to heating oil. I would hope you would support promotion of biomass awareness and policies through the BIOMASS CAUCUS. Environmentalists must stop letting the perfect become the enemy of the possible. For three years I have been writing about the frustrated attempts to get legislation passed through Sacramento that would enable the state's municipalities and utilities to permit diversion of municipal solid waste post-recyclables to conversion technologies that would recover energy, create biofuels and green chemicals, and reduce the volume of post-recyclables moving onto landfills by roughly 85%. The anti-thermochemical stance of the legislation's detractors who preach that gasification "is just a more advanced form of incineration" has been the non-scientific excuse used most often to obstruct passage. In 2007 Assembly Natural Resources Committee (led by chairperson Loni Hancock of Berkeley, CA) derailed AB1090. The latest iteration of the bill (AB222 sponsored by Republican Anthony Adams and Democrat Fiona Ma) flew through the Assembly and received the support of the Utilities Committee of the Senate before it was two-yeared by the Senate's Environmental Quality Committee (which has now-Senator Loni Hancock on it). This in spite of the diverse and overwhelming support it has received throughout California. It is anticipated that Assembly Bill 222 (AB 222) will be heard in the Senate Environmental Quality Committee later this Summer, following budget negotiations. AB 222 is California legislation designed to expedite the introduction of conversion technologies that will produce advanced biofuels and/or green power from carbon-based wastes. With Republican and Democrat co-authors, this legislation has gained bipartisan support amongst the business, environmental, labor, and government sectors. The legislation removes from statute a scientifically inaccurate definition of gasification, establishes a new regulatory category for a "biorefinery" and confirms that the biogenic portion of the municipal waste stream qualifies as a feedstock for renewable electricity under the Renewable Portfolio Standard. Last Year, AB 222 passed the California State Assembly by a vote of 54-13, after having been approved by a unanimous bipartisan vote of 11-0 in the Assembly Utilities and Commerce Committee. In July, it was approved in the Senate Utilities, Energy and Communications Committee. The Governor has endorsed the legislation, enabling the California Energy Commission to testify on its behalf, and there is significant support for the bill in the State Senate. This legislation is necessary for CalRecycle and local agencies to deploy the solutions they judge, after extremely careful analysis, the solutions they find appropriate, clean, and most affordable to meet AB32, the RPS, LCFS, and other mandates legislated in California. On April 20, 2010, the Los Angeles County Board of Supervisors unanimously approved recommendations from the Los Angeles County Department of Public Works to initiate Phases III and IV of the Southern California Conversion Technology Project. Additionally, Supervisor Yaroslavsky introduced a motion that will expedite the County's efforts to identify locations in Los Angeles County for Phase IV of the project. Please click here to view the Board Agenda item. a. Arrow Ecology and Engineering & CR&R Incorporated ? proposing a 150 ton per day anaerobic digestion process in the City of Perris, to be located at the MRF/TS owned and operated by CR&R Incorporated. b. International Environmental Solutions & Burrtec Waste Industries? proposing a 184 tons per day pyrolysis process in Unincorporated Riverside County, to be located at the MRF/TS owned and operated by Burrtec. c. Entech Renewable Energy Solutions & Rainbow Disposal Company ? proposing a 360 tons per day gasification process in the City of Huntington Beach to be located at the MRF/TS owned and operated by Rainbow Disposal Company. 2) Approval of a four-year consultant contract with Alternative Resources Inc. to provide technical, permitting, and funding procurement assistance to each of the demonstration projects and to assist with the technology evaluation and development of Phase IV commercial projects within LA County. The agenda, which includes the official recommendations from the Department of Public Works, may be accessed by clicking here. Last November the Southern California Waste Management Forum (SCWMF) met at its 38th annual meeting to discuss future directions for municipal solid waste management in the region. 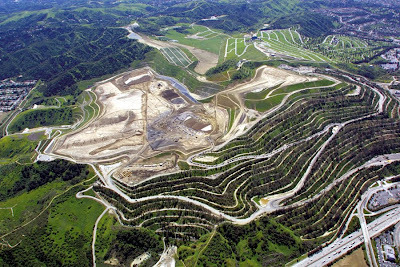 2010 is an important year because time is running out before the 2013 closure of Southern California's largest landfill (Puente Hills). This is also the year that AB 222 will be reviewed by the Environmental Quality Committee before proceeding onto the California Senate floor for a vote. Without passage of AB 222 local municipalities will have fewer options for deploying regional solutions to the state's strict recycling and landfill diversion mandates. Speaking eloquently on this occasion about the dichotomy of competing camps and the need for collaborative and regional decision-making was William ("Rick") Brandes from the U.S. EPA in Washington, DC. Rick has recently retired from his position as Chief of the Energy Recovery and Waste Disposal Branch, Office of Resource Conservation and Recovery. His presentation was titled "EPA and Energy Recovery from Wastes." He talked about the polarized stances that have formed over the energy recovery issue and the need for the two camps to come together. He pointed out that increasing climate change concerns have forced analysis of comprehensive mitigation strategies for which energy recovery is evolving as a major player. "Increased recycling and energy recovery provide significant greenhouse gas emissions savings," he asserted. He pointed out that in Europe population density and lack of open land has convinced policymakers of the need to enable utilities to deploy energy recovery and centralized heating and power (CHP) systems. The emphasis there is on substituting waste-to-energy facilities for landfills. These facilities are situated within the communities they serve without toxic impacts on surrounding populations. In fact, as his graphic shows below, the countries with the most comprehensive recycling programs are also the ones that use incineration the most. This logic seems to be an affront to some recycling and "zero waste" proponents who argue against energy recovery using thermochemical means no matter what the emissions profile is. In this month's MSW Management magazine, Rick Brandes admonishes those who refuse to recognize that solutions are regional and require cooperative effort to achieve. Below are some excerpts from this article. Having recently retired after 31 years working on waste management regulations and policy at the US Environmental Protection Agency, I’d like to voice a massive frustration on the state of municipal solid waste management policy in this country. In one camp are the “zero wasters.” They see a world where real integrated materials management means all materials are contained in a continuous use/reuse cycle: organics to composting and soil enhancement, recyclables returned to use either in closed or open loop recycling systems, metals and glass back to new metals and new glass, and paper back into paper. They see the public as ready for a massive change to a more sustainable lifestyle, trashwise. And, incineration is viewed as the enemy of zero waste, not a complement. In the other camp are the “energy recoverers.” They see a practical, realistic world, where real integrated materials management is driven by market forces, where recycling occurs when it makes market sense and energy is recovered from the bulk of the remainder of the non-recyclable municipal wastestream through mass-burn incineration or advanced thermochemical conversion. They see it as a decision on whether to landfill or recover energy, not whether to incinerate or recycle. They see the public as most likely to do what they are currently doing—and that doesn’t include a big change in lifestyle, trashwise. It’s not like there are no alternative strategies. There are many, many ways to beneficially use this trash mountain of ours. Augment soil. Generate power. Make paper and save trees. Reduce bauxite mining. Recover even more metal out of the ash. Make park benches and roads. Produce ethanol and biodiesel. Use all alternatives where they make sense. 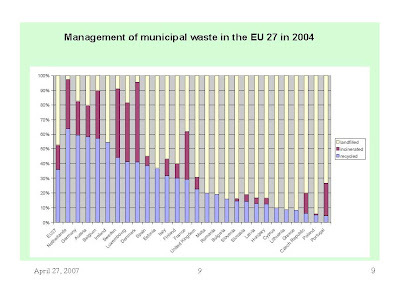 Use different waste management strategies in different places. Do more of some of these things in some places and less of them in other places. But don’t editorially gun people down when they don’t do what you think they should do. Give communities the best available information, and they will probably do what is best for them. Let them make their trash more valuable. About the only thing we can say right now is that there exists a massive lack of consensus on what constitutes an effective integrated materials management strategy. That has to change. I will be speaking about this and sustainable supplies of rural biomass during the Opening Session of the Waste-to-Fuels Conference in Jacksonville, FL April 18-20. Chalk one up for the fossil energy status quo. Last Thursday, as a result of obstructive votes of five members of the California Senate Environmental Quality Committee (SEQ), a crucial piece of renewable energy legislation titled "Assembly Bill 222" has been delayed yet another year. Call it a failure to launch. If approved, this legislation would have responsibly (and with articulated recycling and environmental safeguards) given statewide municipalities and utilities the necessary authority to deploy new technologies (in particular, gasification and pyrolysis) to meet and even exceed statewide landfill diversion mandates by converting municipal solid waste into biofuels and biopower. • Despite the expressed support of nearly 80 organizations in favor AB 222 (vs. 19 against), which was unanimously approved by the Assembly Utilities and Commerce Committee in April, and which passed the heavily Democratic California State Assembly by a vote of 54-13. • Despite approval of the bill by the California Senate Utilities, Energy and Communications Committee on July 7th. • Despite national bipartisan initiatives to develop alternative fuels and renewable power - namely EISA, the Farm Bill, the cap and trade bill, the preponderance of state Renewable Energy Standards. • Despite the President spurring governmental agencies to stimulate the economy by quickly approving development and deployment of renewable technologies with investment and policy incentives. • Despite California's precedent-setting Global Warming Solutions Act (AB 32), its aggressive Renewable Portfolio Standard, and its ground-breaking Low Carbon Fuel Standard designed to provide cleaner alternatives to fossil fuels and power. • Despite Governor Schwarzenegger and the California Energy Commission supporting the legislation as a necessary component of his Bioenergy Action Plan. • Despite a national and California state financial crisis that is the worst since the Great Depression. This legislation would have created jobs and drawn significant private industry investment to the state. Had the SEQ Committee not interfered the measure was certain to pass the Senate with balanced bipartisan support. California has a long history of facing crisis after crisis with intelligence, industry, investment, and heroic engineering. It has built paradigm changing technologies in defense, nuclear energy, water and waste management, educational systems, entertainment, environmental practices, computers, and communications that have not only funded the state's phenomenal growth and global influence, but also changed the world. Not anymore if, as in this case, a few politicians can continue to derail progress when we need it most. Progress to introduce renewable alternatives before our valuable resources run dry. Progress to reduce fossil emissions that threaten public health and global climate change. What are they waiting for? In a word - "perfection." 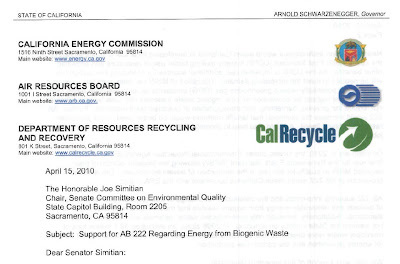 Opponents to AB 222 are holding out for zero waste and zero emissions. Zero waste is a universal ideal that we all can agree on whether its energy, natural resources, human capital, efficiency, infrastructure, or funds that is being wasted. The question is not what is the perfect solution, rather how do we improve on the status quo? Inertia is the enemy of progress - it's a form of waste - wasting time. You can't improve on the status quo by waiting for the perfect answer. We need to support those who spearhead new improvements that build toward better solutions. That's why Washington is abuzz with the phrase "Perfection is the enemy of the good." Zero emissions is another example of an ideal that is unachievable without taking progressive steps toward a solution. That's because emissions have many direct and indirect sources. The indirect land use issue is a controversial example of the interconnectedness between sources, processes, and emissions. California's Low Carbon Fuel Standard - and, until recently, the proposed federal cap and trade bill - would handicap certain biofuels for their anticipated direct and indirect impact on worldwide fossil carbon emissions. This is a classic Catch-22. While we all agree that fossil fuels and fertilizers need renewable replacement, it is unfair to base comparisons of alternatives on their current dependence on fossil fuels for production. Fossil emissions are emitting during production of renewable fuels and power because there are currently no alternatives. We won't have alternatives until we create them. Once we have them we can use biodiesel to replace diesel, and ethanol to replace gasoline, and wood pellets to replace natural gas, etc. 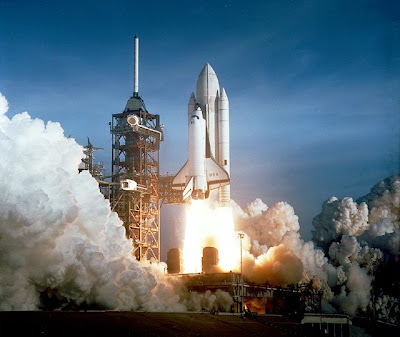 But we need to "launch" new alternatives first - and as any Floridians can attest, escaping earth's gravity (launching) takes a significant amount of fossil energy - because that is all we have. The space shuttle is not perfect. But it is a great example of a technology that resulted from progress through many "good" steps - from Kitty Hawk to Cape Canaveral. And created many byproduct technologies that we cherish today. Policy-makers need to enable private enterprise ventures to research, develop, and deploy good solutions - not hamper them. Their deployments will still have to conform to economic, environmental, and social sustainability standards. Enabling legislation is a cheap way for governments to lure investors to take on the financial risk of emerging technologies. Policy delay increases risk and, hence, reduces investment which slows the rate of change and the potential return on investment. California has failed to launch. Let's hope that other states pick up the gauntlet and lead. A showdown is looming in the California State Senate this summer over an issue that is at the heart of the nationwide drive to develop and deploy bioenergy conversion technologies. In a state that prides itself on its landmark achievements in outlining Global Warming Solutions (AB 32), Bioenergy Action plans, and Low Carbon Fuel Standards, access to some of the most sustainable feedstocks for conversion to bioenergy is currently blocked by inexact statutory language and permitting regulations. As a result, municipalities and utilities are frustrated in their ability to exercise local authority over how they meet stringent waste diversion goals to reduce reliance on landfills for dumping post-recycled waste. Post-recycled municipal solid waste is considered to be the most sustainable feedstock for biomass conversion into biofuels and biopower because, unconverted, this waste emits greenhouse gases while it decomposes. It is the only feedstock that has "negative" cost - receiving facilities receive per ton "tipping fees" that vary from region to region. Socially, it could provide good urban jobs that cannot be off-shored. 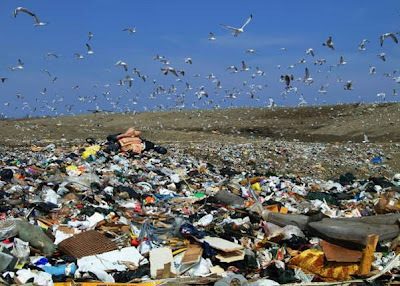 At the rate that municipal landfills are filling up and closing down, there is no time to wait. The state's largest landfill in Puente Hills, which services Los Angeles County, is scheduled to close in 2013. MSW currently disposed of there will instead be sent by train to a landfill 200 miles away! Legendary former California State Senator (President Pro Tem) David Roberti and his Bioenergy Producers Association (BPA) is working overtime this month lining up support for passage of the bipartisan California Assembly Bill 222. With over 60 organizations supporting it (including municipalities, utilities, labor organizations, waste disposal facilities, and others) the bill was unanimously approved by the Assembly Utilities and Commerce Committee on April 27, 2009, and passed the State Assembly by a vote o 54-13 on Monday, June 1st. The Senate is expected to be a much more challenging battleground where, without support, the act might not get out of committee. AB 222 proposes to update the Integrated Waste Management Act of 1989. It is one of those seemingly innocuous pieces of legislation that only a policy wonk could love, but it is extremely important because without its passage municipalities will continue to find it virtually impossible to permit and fund deployment of municipal solid waste conversion technologies around the state. In a Catch-22 they are penalized for not deploying solutions that achieve minimum state diversion targets.. If passed, deployment of such facilities could divert approximately 30 million tons of post-recyclables from landfills while producing biopower and biofuels in accord with state (AB 32) and national initiatives (EISA, the Farm Bill, and pending Waxman/Markey cap and trade bill) to reduce greenhouse gas emissions. The strongest opposition to the legislation is being coordinated by Californians Against Waste (CAW). They see the bill as a threat to their sizable influence over waste streams in California. The BPA acknowledges the contributions that CAW has made to reducing, reusing, and recycling MSW in the state but dispute the contention that this measure will set recycling back. Instead, they emphatically assert it will help expand recycling in the state. To point out other discrepancies, BPA is currently distributing a document titled CAW Misrepresents Renewable Energy Bill (AB 222) throughout Sacramento itemizing CAW's objections ("myths") and countering them with the facts at the foundation of AB 222 as written. The document charges that "Californians Against Waste has repeatedly attempted to discredit or thwart legislative and regulatory initiatives that would make possible the production of advanced biofuels and green power from these resources." At a common sense level, if society can't even agree that post-recyclables are qualified feedstock for conversion to alternative forms of energy then the likelihood of other feedstocks being qualified is virtually nil. It is time for legislators to put more authority back in the hands of municipal governments to meet their diversion goals and to determine what is and what is not safe and sustainable. Public and private industries will always have to meet stringent standards on emissions and pollution for any solutions they deploy.